Last night I woke up at 3:00 a.m. heaving and sweating. A bug-eyed, banged and beaked entity was haunting my mind’s eye. Online, she’s just known as Momo. Heart pounding, I tossed and turned, unable to get her grody face out of my head. I’d think the image had passed and, boom, my brain would flash her visage again. I ruminated and spiralled. What if I really did get a message from this entity compelling me to do bad stuff with the threat that I’d only see worse things if I didn’t? All of which is to say this: Dear readers, I am utterly terrified of Momo. I know where she comes from, but that doesn’t make it any better, really. The creepy image is actually a photo of a sculpture called Mother Bird created by the Japanese special effects company Link Factory. Last year, authorities around the world began sharing warnings of the “Momo Challenge,” where WhatsApp users adopting the image would supposedly tell children to perform increasingly extreme acts, sharing gory images if they didn’t, and allegedly driving some to suicide. Some news outlets warned of the challenge, while others realised that most Momo-related claims were poorly supported and the whole thing stank of a hoax. The panic reignited again this week, when an Irish police department shared yet another warning on Facebook—and concerned parents signal-boosted the message. Websites have returned to writing blogs either warning people not to talk to strangers on WhatsApp or reminding readers that the Momo Challenge moral panic is almost certainly a hoax and that no deaths have been definitively linked to it. Regardless of their angle, they all share an enormous version of the same, terrible lead image without warning. The sculpture’s face has appeared over and over again on my Twitter feed in recent days, shared by both click-hungry news outlets and mostly responsible journalists. Each time, I jump out of my seat a little and close the tab. Momo is etched into my brain. I can’t escape her gaze. I’m afraid to continue using social media for fear that I’ll see her face again. This isn’t the first time I’ve had such a visceral reaction to shock imagery. You might remember an episode of Courage the Cowardly Dog titled “King Ramses’ Curse.” I watched the episode late one night as a child while sitting alone on the living room couch. 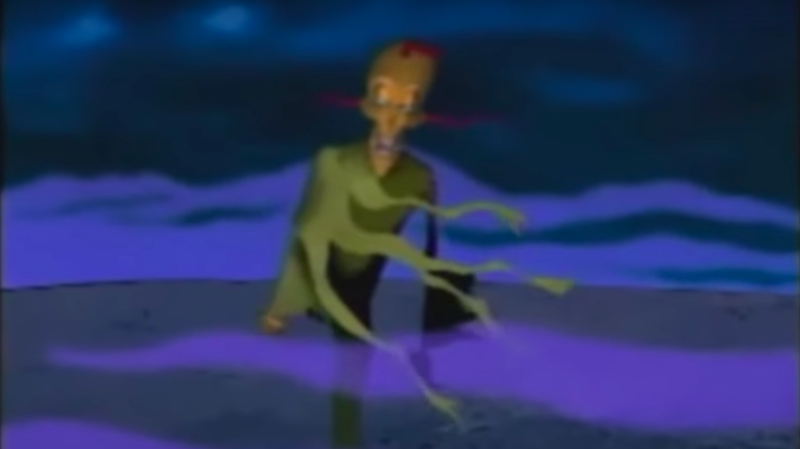 King Ramses appears on the screen in a fog, moving awkwardly and moaning “return the slab or suffer my curse.” I couldn’t fall asleep for several weeks without seeing Ramses’ haunting image, and never watched a full episode of Courage the Cowardly Dog again for fear that I might see him once more. I had a similar reaction to the Chinese ghost cab faces. I’m just not good with body horror. I’ve attempted to block Momo out of my life. One of my editors promised I could publish this blog without looking up Momo and that he’d fill in some of the facts so I wouldn’t have to see the horrible face again. Call me a wimp, but I just shouldn’t have to see shock imagery more than is absolutely necessary.